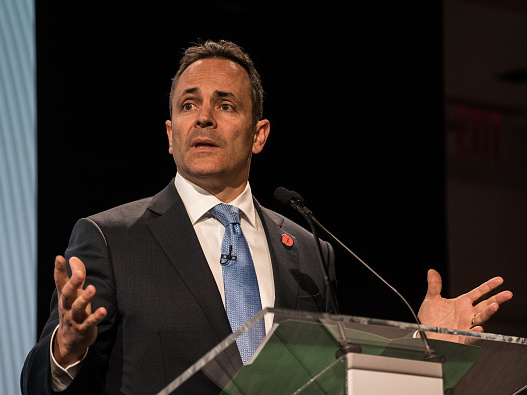 Sexual Harassment Scandals Abound In Statehouses Across The U.S. : The Two-Way Kentucky Gov. Matt Bevin is calling for the resignation of lawmakers who have settled sexual harassment claims, after reports that the state House speaker settled a claim with a female staffer. Matt Bevin, governor of Kentucky, has called on any lawmakers or government employees who have settled sexual harassment allegations to resign. At a news conference Saturday, Kentucky Gov. Matt Bevin called for the resignation of any lawmakers or government employees who have settled sexual harassment claims. The Republican governor didn't name names, but the news conference comes just days after reports that House Speaker Jeff Hoover, R-Ky., settled a complaint with a female staffer out of court. "There have been any number of allegations in recent days that would indicate that certain individuals have been anything but faithful and true," Gov. Bevin said. "These allegations have not been denied by anyone. These allegations are increasingly becoming corroborated." The message was reiterated on the governor's Twitter page. "These are hallowed halls," Bevin said Saturday. "There is a higher expectation of moral authority from the people who are elected to come here." The governor cited "multiple events and multiple people," implying he wasn't only speaking to Hoover. The Louisville Courier-Journal first reported that Hoover secretly settled a complaint with a staffer who threatened to sue him and others for sexual harassment. As Kentucky Public Radio's Ryland Barton reports, Hoover allegedly exchanged sexually explicit text messages with a female subordinate, and requested pictures from her in 2016. Another female staffer in Hoover's office says she was placed on leave for reporting a toxic workplace culture. A number of GOP representatives from the Kentucky House joined Bevin Saturday in calling for Hoover's resignation. Hoover has said he will not resign from his position as representative, but said he will step down from his leadership role in a tearful press conference Sunday. He admitted to sending explicit text messages to his staffer, but said those conversations were "consensual." Kentucky is far from the only place dealing with allegations of sexual harassment in state government. In Florida, six women have accused the the state Senate's budget chairman Jack Latvala of touching them inappropriately. In Illinois, a former federal prosecutor has been appointed to address an ongoing sexual harassment scandal after Democratic state Sen. Ira Siverstein lost his leadership position due to allegations from an activist who worked with him to pass legislation over 18 months. An open letter from women working in the Illinois state Capitol reads: "Every industry has its own version of the casting couch. Illinois politics is no exception. Ask any woman who has lobbied the halls of the Capitol, staffed Council Chambers, or slogged through brutal hours on the campaign trail. Misogyny is alive and well in this industry."